Anyway, I belong to a Yahoo Group for creative folks that like to use Michael Strong Stamps. In this group, we volunteer to post daily cards for inspiration : ) Each day of the week we volunteer, and Thursday is a tutorial project. I used a lilly stamp on the background, and the large lilly image was stamped, embossed with white EP and colored with Copic markers. I love the tone on tone colors and the softness of this card. The snowflake cardstock is Poison Ivory and is a tiny bit off white- and very shimmery IRL. The Die is from Memory Box (Sweet STamps carries them). The background is another Washi tape background (Washi Flip Flop from Technique Junkies Washi Tape CD), like the one I made for my previous post. We have a White weekend here- with between 6-8 inches of snow. I was able to use up some of my Washi stash- made a few of these backgrounds, so you will see more of them in the near future. This Washi Flip Flop technique is from the TJ Washi Tape and Ribbon CD. I used SU Embrace Life (retired) for the flowers and the sentiment is from Technique Junkies. This is an older stamp by Stampendous from the Precious Moments line- called Friends. I stamped the image and colored with Copics. I used the sketch from Sweet Sketch Wednesday using DP from a few years ago by Prima. The cardstock is by SU. This is retired older DP by Basic Grey- I love these colors. More Copic coloring.... I love this sweet stamp : ) I have absolutely no clue where the sentiment is from. The sentiment and the scallop are all one. I colored the scallops in pinks and added shimmer using a Sakura Gelly Roll pen on the l ittlecircles. Can you see the pink rhinestones in the upper Rt corner? I used the Sketch from Tuesday Morning Sketches for this card. I have a sinus infection and lost my voice earlier this week. I had to work today, so spent yesterday on voice rest ( I normally talk lots... ). So, I thought coloring would be a great way to keep myself occupied. At the Oriental Stamp Art Yahoo Group, there was a swap for cards with a boat theme. 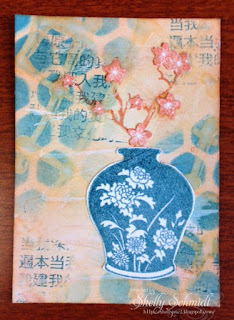 I used a pre-colored image from Ginny at Maxam Made Studio and matched some Washi and cardstock to finish off the card. Interesting, without the blue cardstock to back the boat, more yellow pops out of the Washi, doesn't it? My ATC group swapped Wax/Encaustic/Crayon ATC's in October. I used Crayons for mine.... You can click to enlarge them for a better look. Images by TH- Crazy Birds, Vera Lang digi's and Dyan Reaveley bird. Next, Iron the ATC- I placed it in between Deli paper. You can use paper- you just DO NOT want to get wax on the iron plate. These are my finished ATC bases. I put together another card with the HYYCT challenge 1531A from SCS in mind. The theme is Stop and Smell the Roses. I found a card kit while moving my stamping room, and decided to put it together. 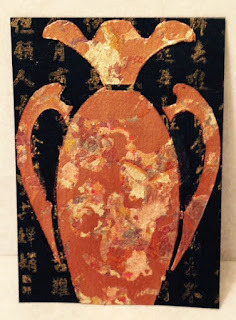 This was a prize from Ginny Maxam from Maxam Made Studio a very long time ago...... I do not know where the sweet image came from- it was in the kit. I colored it with Copics and fussy cut her out. The green border was also in the kit. I added butterflies from a technique piece of TJ leftover shimmery pink and gold, and added rhinestones to the centers. I added a bow and some sequins as well. I used Distress Inks on the background, some Stenciling, overstamping with Asian Kanji. 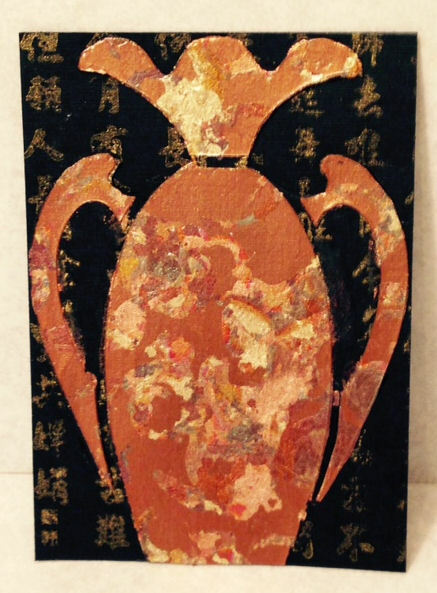 I stamped the Vase image (company UK) using Versamark and then Distress ink, and embossed it with clear EP. I added a Sweet Stamps floral image. I stamped the image a 2nd time, and fussy cut out those little flowers and added them to the top. Sweet Stamps has an Anything Goes challenge. Brown Sugar has a challenge calling for flowers. The shimmer and glimmer is amazing on this beautiful ATC IRL.